There’s just one term season for 1600 Penn. NBC has cancelled the Thursday night sitcom after one season and 13 episodes. 1600 Penn follows the dysfunctional Gilchrist family as they adapt to life in the White House. 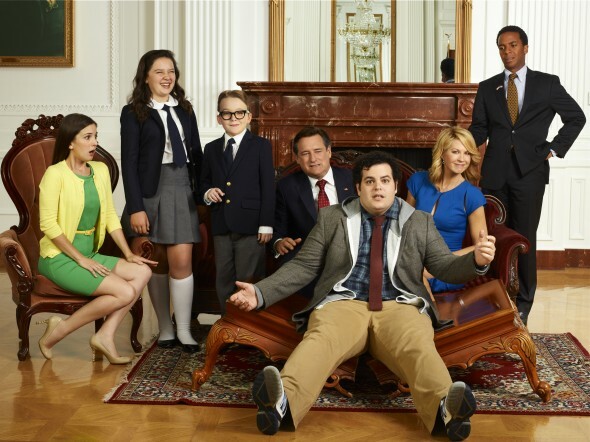 When the public voted Standrich Gilchrist (Bill Pullman) into office, they likely had no idea that they were getting his goofy son “Skip” (Josh Gad) as part of the deal. The show also features Jenna Elfman, Martha MacIsaac, Andre Holland, Amara Miller, and Benjamin Stockham. The sitcom previewed on December 17th to a 2.2 rating in the 18-49 demographic and 6.88 million viewers. For NBC, those are very good ratings. Unfortunately, 1600 Penn couldn’t hold onto those numbers. The second episode drew a 1.6 rating and 3.86 million on January 10th. A week later, the ratings fell to a 1.2 in the demo and 3.04 million. The numbers kept falling as the weeks progressed and the finale was the worst-performing episode yet — falling to a 0.7 rating and 1.91 million. It was clear that this would be a one-year sitcom. Those ratings are terrible, even for NBC. What do you think? Are you sorry that 1600 Penn has been cancelled? Did you like this sitcom? We really liked this show! Can’t believe it got cancelled. We want to know what’s happening with the baby and everything else????????? I cannot believe that this show got cancelled!! The end of season 1 left SO MANY questions!!! It would’ve been cool just to see where they were going with the next season! This was the best new series out there I loved this show it had great adult humor with a childish twist i cannot believe NBC did not renew this show a good holsom comedy.